We left Bristol in reasonable weather, arrived in South Wales to freezing rain and a gale blowing, the joys of starting 300 odd metres up the hill, it was nice to see the lights of Abergavenny twinkling below. I've only been to Draenen once and we didn't get very far due to one of our party struggling in the entrance series, and the restrictions of a mid week evening trip. I'd worn my furry and my thermal wetsuit tope I wear for outdoor swimming. 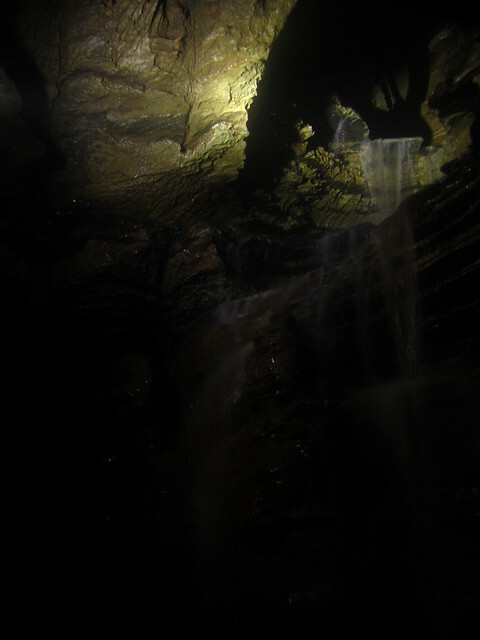 I was glad of it as the entrance series was rather wet and we all got a bit of a soaking in the waterfall squeeze.Tim was a bit disgusted I managed to pass through the tight section stood up and stooping. I delayed everyone a bit taking a few snaps and looking at the geology of passages. Dave headed onwards to rig the ladder. You can climb the pitch without (there was a handline rigged) but I was glad of the security of the ladder/lifeline. 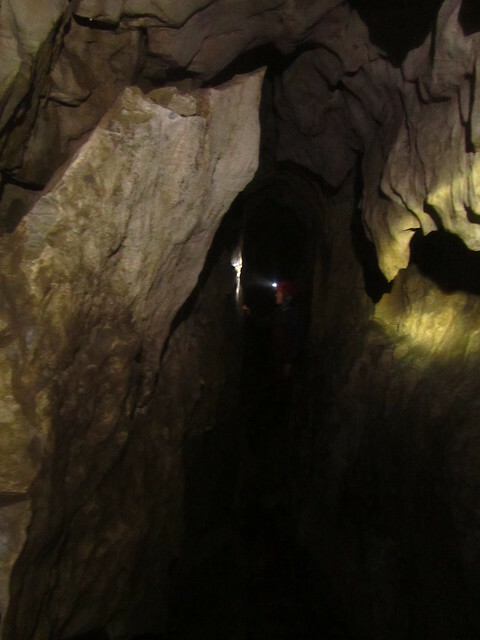 Dave had brought a super bright hand held torch with him, and it was amazing to light up the chambers with it. My light isn't very bright and often I can't see the extend of big chambers with it. 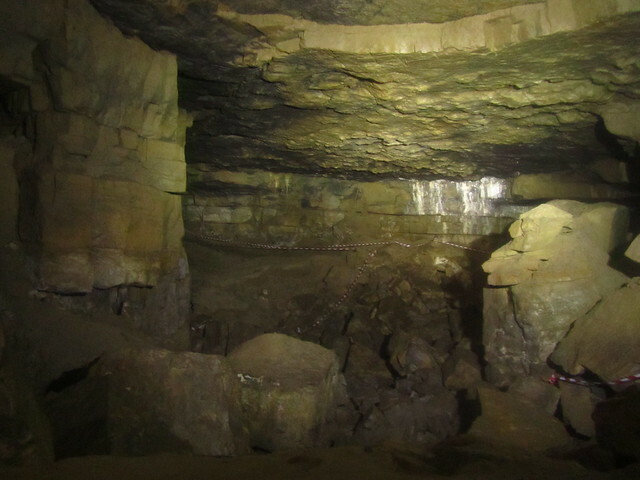 It was so impressive being able to see the size of the cave. 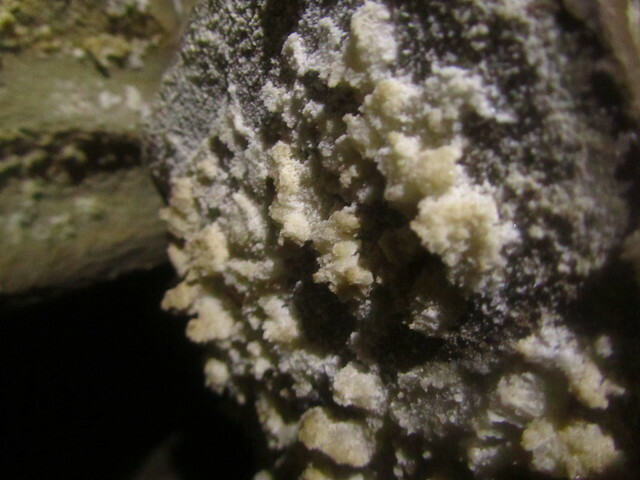 We signed the log book in Cairn chamber, I was amazed how few trips there had been to this amazing cave. We then headed off for our explore.. When we arrived in Tea junction chamber I thought I heard voices, I put it down to the water in the chamber, I stopped and listened and heard it even more distinctively, I mentioned it to Tim who also thought he could hear something, Dave agreed too. Panic started to rise a little and Dave shouted out to ask if anyone was there (we knew there wasn't as no-one was signed into the cave in the book) I have an overwhelming desire to get out of the strange sounding chamber so only a brief snap was taken. In retrospect I'm sure it must have been the water making the noises, but it really was rather odd! After we'd had a bit more of an explore around it was regret we head to head back out again into the gale. 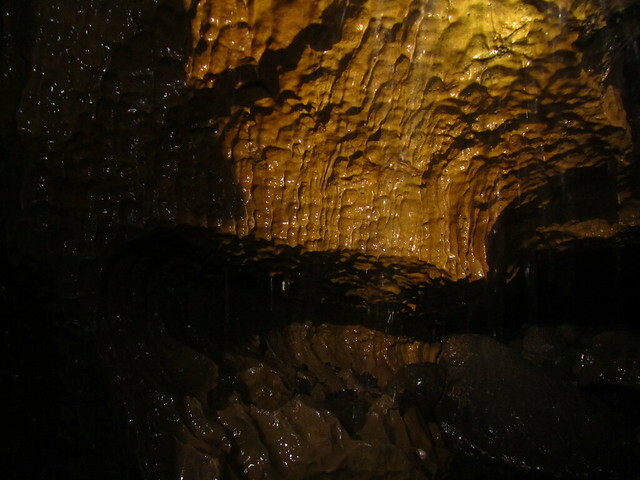 What an amazing cave, I'd love to go back another time to explore some of the decorated sections & to do a longer trip. Wasn't so keen on the deluge of wind and rain we got on exit. We missed the pub, but Dave and I enjoyed a can of cider en route home! We were in Draenen too on Wednesday and visited Riflemans chamber. We definitely signed in at Cairn junction and I even photographed Clive doing it! Perhaps we were behind you? 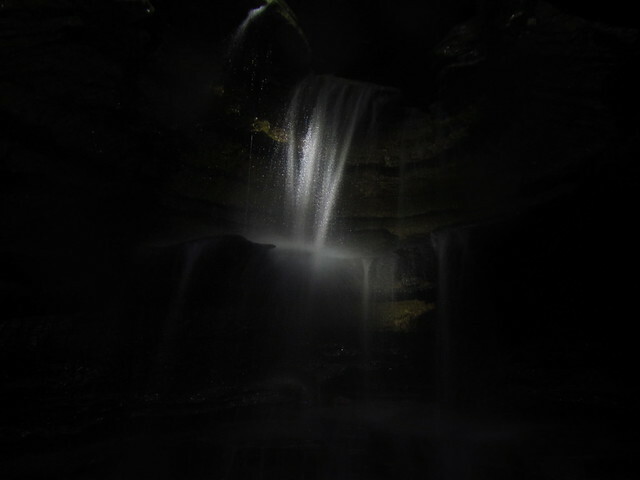 We entered the cave at 11am as we were slightly waylaid by the chatty and friendly landowner. 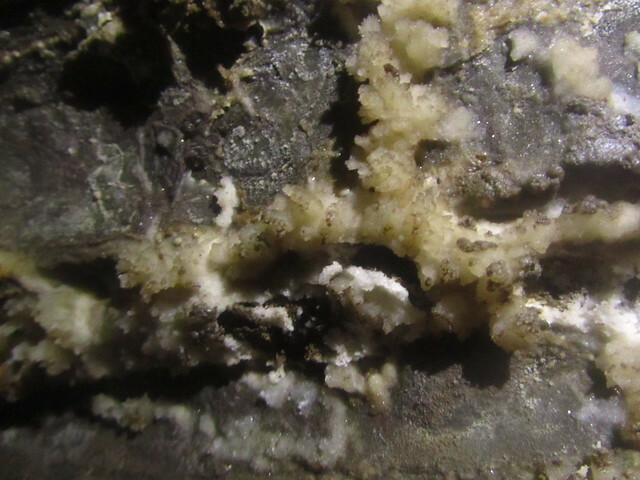 Ps I was convinced too that I distinctly heard people, but like you did not expect other cavers and Clive mentioned the last group into the cave being Belgians! Running water often sounds like people talking. We had a fab trip thankyou Sounds like you did too. Poor Draenen gets dubbed 'Ogof Boring' which I always thought a little unkind. preferred Cuckoo Cleeves - bad decision. 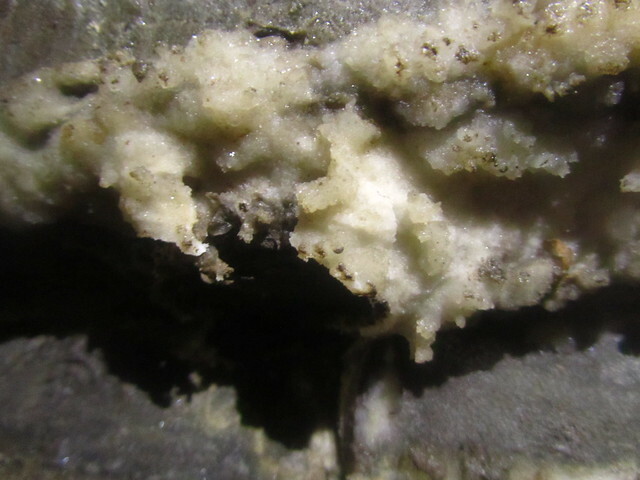 Ruth had only been once before, but Tim had a soft spot for the cave becaus eit was his second caving trip ever (oops). Well we did not put him off - but he still complains about the entrance series even now. 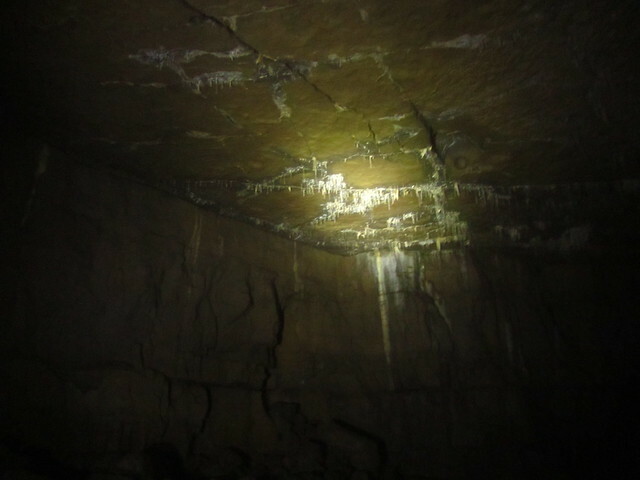 For an evening trip you hardly see any of the cave as the cave system is so enormous. But we have visited a few little nooks and crannies in the entrance series over the years and this trip was another one. The idea is that we at least get familiar with the entrance series and have a nice basis for longer trips. 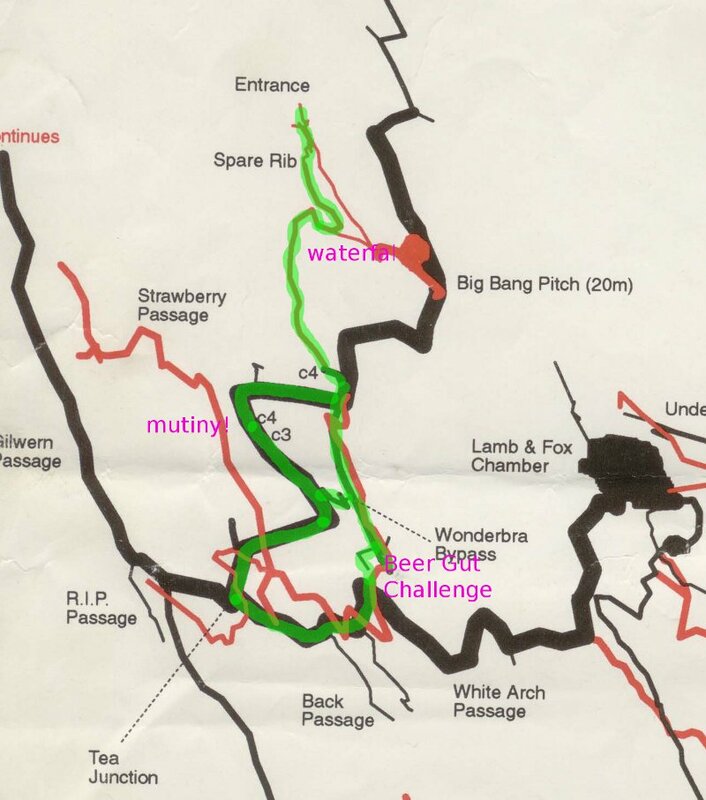 We had two objectives - one was the beer gut challenge - instead of using the wonder bra passage to make a quick connection to T-junction from cairn passage we continue straight ahead and cut a substantial corner off the route to lamb and fox chamber. I was unaware of this route for many years, but for several years the name was enough to put me off. I was not really looking forward to it. The second objective was an alternative connection between the T-junction and cairn junction. 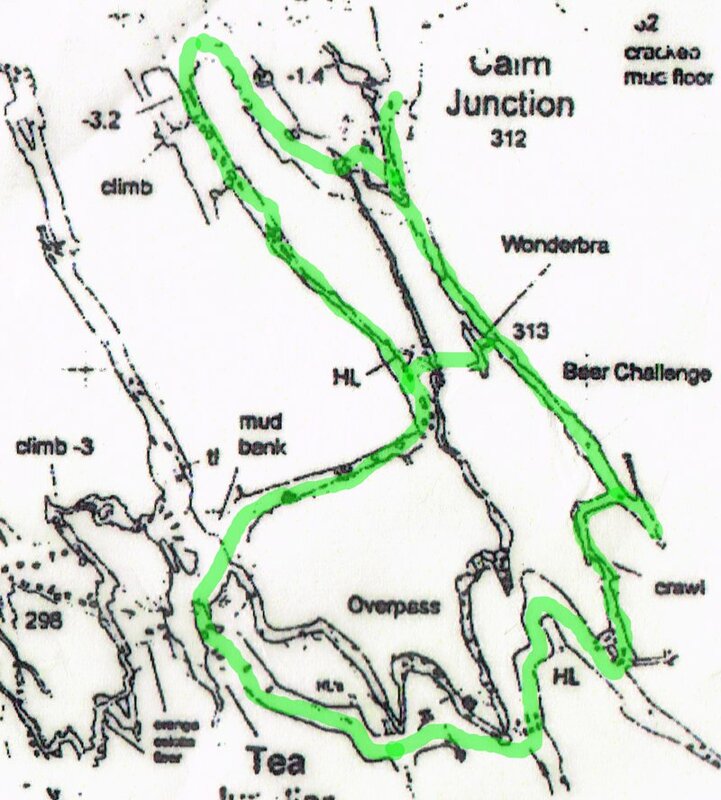 We had always avoided this route because there were two climbs marked on the route (4 and 3 metres). But we had never even looked at the climbs. Here is the map in glorious detail - it should have been easy. But for some reason I did not realise I had this map until we passed cairn junction on the way out. I left all my maps at cairn junction and we completed our trip without a survey. Here is the view in the other direction. My light sabre was pretty good in these enormous passages and I wished I had taken more photos. But this trip I was more interested in the beer gut challenge. 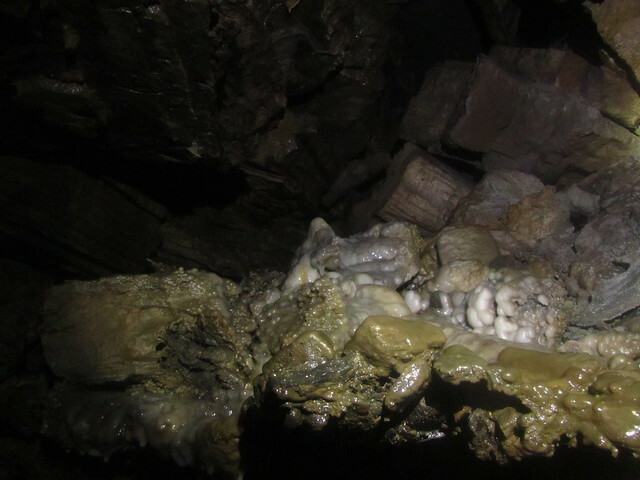 The picture shows the boulders that plague any trip into Ogof Draenen. followed by Tim and myself bringing up the rear. The largest bringing up the rear - surely it safer to send the biggest first. the passage takes a dive downwards - oh well head first and repent later if I need to reverse - I would rather see the way on. Easy enough I emerged out and crawled on to a point where I could stand up and hear a stream! We had done the beer gut challenge. Tim seemed to think that it is not really a challenge as the cave rescue people use this route to bring their stretchers out. Hmm that would be more of a challenge. He is Ruth watching Tim finish the beer gut challenge. 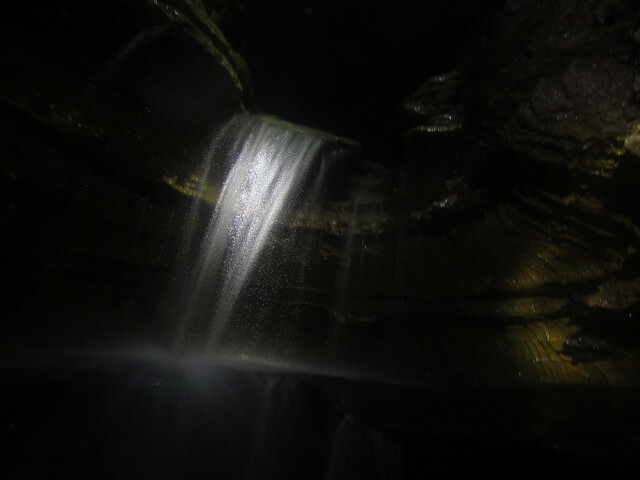 We climbed down the small drop into white arch passage - and took a right turn to head for T-junction. The clambering over boulders seemed to take ages and it was here, while we were boulder hopping, that we started hearing voices. The walk went on and on and I was regretting leaving my maps at cairn junction. After a number of false T-junctions and tapes which we had not noticed before we finally arrived at T-junction - although we were not certain until we had walked up the streamway a bit. the boulder marking the connection. But we ignire the usual connection and continued on along the passage, wading through water up a mini climb until we faced the two climbs - one down and the other up immediately after. Ruth and Tim stopped not wanting to go on, but it was quite easy to slide down the drop. It was reasonably easy but exposed to climb backup on the other side. Tim and Ruth were not convinced it was for them. I continued on hoping to find the alternative connection to cairn junction but I went on for what seemed ages ignoring Tim's calls to come back. But I did not recognise anything and so I returned to Tim and Ruth. We retraced our steps to the wonder bra passage connection and made our way to the other side of the chasm or climbs from the cairn junction side. Not quite the hope for round trip but now at least we know how to do it. So we made our way back to the ladder pitch and began to leave the entrance series. On the way out we took some photos of the cascades using the light sabre. so our thirst was quenched but not the same. We got changed and headed back to Bristol. Nice photos which camera were you using? Looks like a fun little evening circuit. I too always think ogogf boring is massively unkind to it. It was one of my earliest trips in '96 shortly after it was opened, so it always has a special place in my caving memories. The trick is to be able to boulderhop with confidence, then you can make good progress. But it gets tiring after a while! Scott and Steve preferred Cuckoo Cleeves - bad decision. Well Dave the Cave, it seems you were the only one that got close to the Beer Challenge! 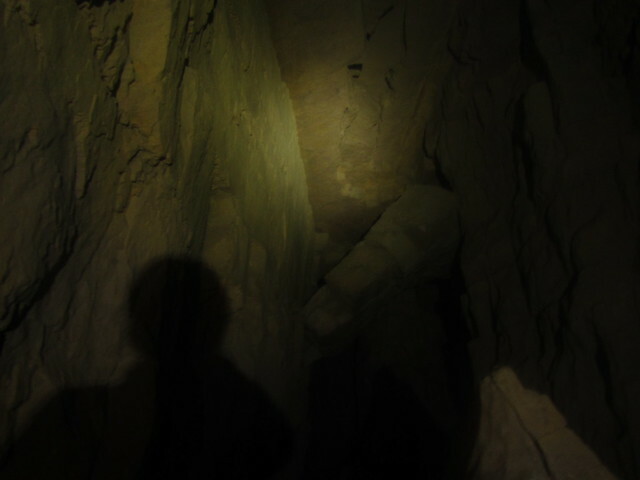 You have to remember that when that bit of passage was first explored and named, Wonder Bra and the connection to White Arch hadn't been dug out and so the whole thing was a dead end side passage. Beer Challenge is the left hand passage, that doesn't go anywhere, that you went up by mistake. The first person up there offered to buy a pint for anyone who could turn around at the end, which is tight and come out forwards. I wasn't there but that's what I was told anyway. Of course, the whole section from Beyond A Choke to White Arch is now referred to as Beer Challenge. Do you have any light to shed on the strange voice sounds Huge? I am pretty sure it was just sounds made by the water, but would be interested to know if anyone has heard anything odd in the cave.. I am pretty sure it was just sounds made by the water, but would be interested to know if anyone has heard anything odd in the cave.. Anyone heard from Alkapton lately?! So rather than a prediction of trouble if you have a beer gut, it is a passage where a beer was offered as a reward. It would be impossible for me, but did anyone try? I've never heard that Ali Garman had to buy anyone a pint. I'd be pretty sure it was the sound of the water you heard, Dave. 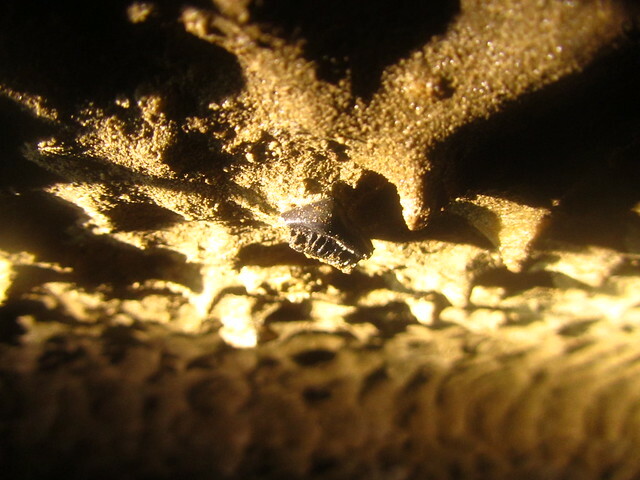 I've had the same experience myself, more than once and in other caves too.